Who hasn’t thought about buying a home? For most people, it’s the Canadian dream. But many renters, who can actually afford to buy their own home, continue to rent. 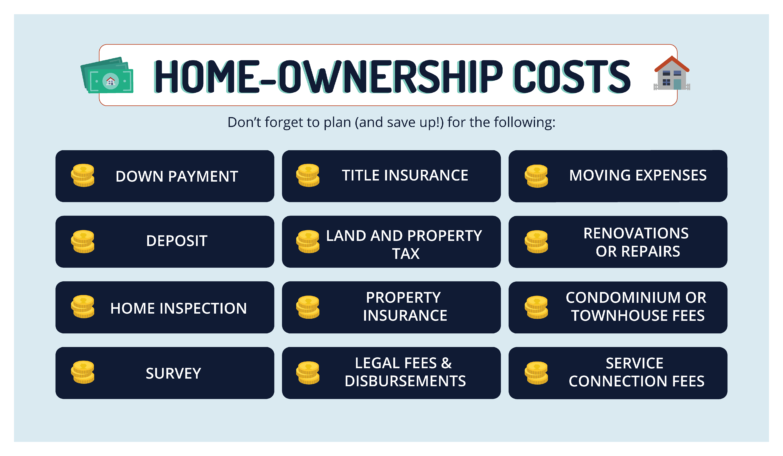 As we learned from the sub-prime fiasco in the U.S., prudence can be a very good thing; but there are also some not-so-valid reasons why we continue to pay our landlords instead of paying ourselves. Jamie will refer you to an experienced mortgage professional who will consult with you about all your options, explain the whole process, and answer any questions that you have. If you are ready to take the next step, that’s wonderful – but you will never be obligated to ‘buy’ something. Home buying – when you are ready – should be easy and fun, not stressful or pressured. Your current monthly debt payments (credit cards, student loans, car loan, etc.). All household expenses (there is a great worksheet provided by the CMHC that you can access here. Your credit history: Obtain a copy of your credit report from Equifax, just to make sure that it accurately reflects your credit history. Report any mistakes immediately. Once all this is written down, you will have a baseline as to what you currently spend, and what your credit rating is. 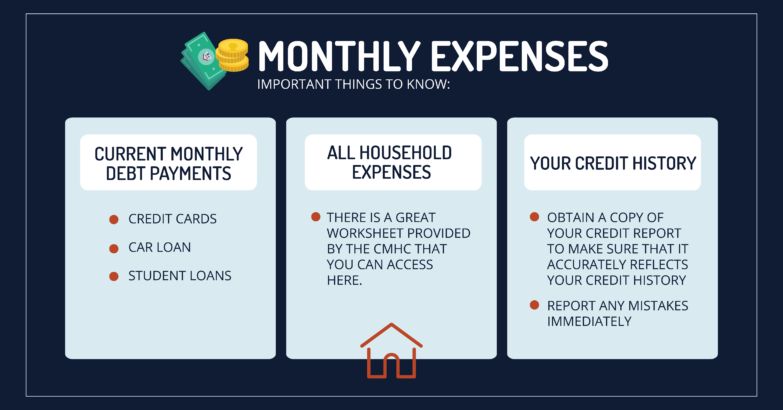 These expenses will be deducted from your income and other assets to help determine how much of a loan you can afford to carry. These figures will provide something you can work with, in the event that you have to pay off certain debts or make budget cutbacks in order to qualify for the mortgage you want. 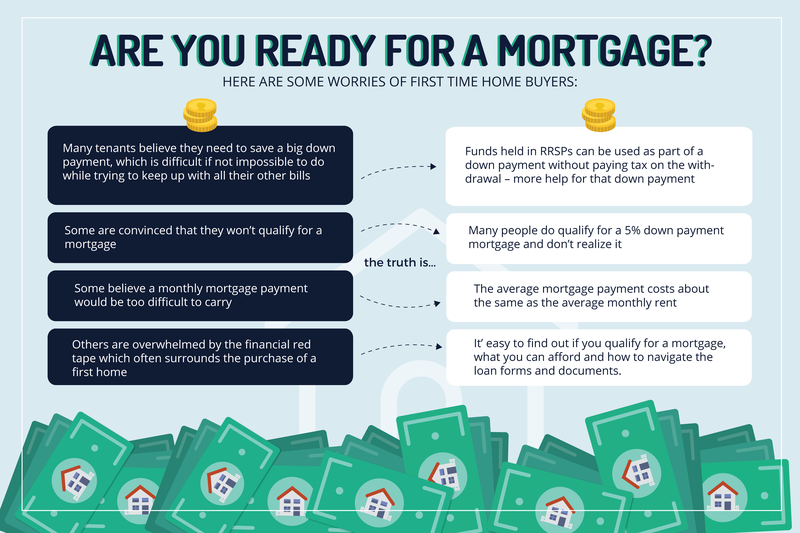 It’s common to get pre-qualified for a mortgage before you begin looking at homes, because you will know what you can afford. 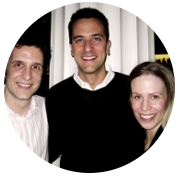 And when we do find a house or condo that you love, you will be in a better position to submit an offer without having to scramble to get fast financing – or put a ‘conditional on the buyer obtaining satisfactory financing’ clause in your offer. 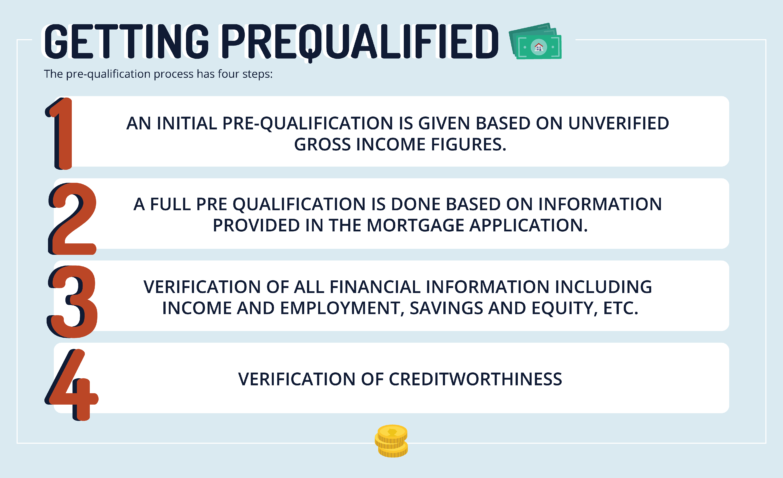 When you are pre qualified, it just means that the lender has reviewed the financial information from your application and has determined a maximum amount of financing you can afford. The information required for a pre-qualification is almost as detailed as that required for an actual mortgage approval. An initial pre-qualification is given based on unverified gross income figures. A full pre qualification is done based on information provided in the mortgage application. Verification of all financial information including income and employment, savings and equity, etc. You should then receive a letter or certificate from the lender outlining their findings when it comes to amortization period, payment schedule, mortgage term, and interest rate (some lenders guarantee the rate they have offered you for up to 90 days). Once you have pre-qualified, consider applying for a pre-approved loan to speed up the purchasing process. Is the part of the home price that does not come from the mortgage loan but from your own money. The minimum down payment is 5% of the purchase price of the home, and you will need mortgage loan insurance from CMHC for another 15% of the home’s purchase price. For a conventional (uninsured by CMHC) mortgage, you need a down payment of at least 20%. Is paid when you make an offer to purchase, to show that you are a serious buyer. The deposit will form all or part of your down payment with the remainder owing at time of closing. If for some reason you back out of the deal without having covered yourself with purchase conditions, your deposit may not be refundable! The typical size of the deposit is 5% and up. Is often recommended and usually costs about $400. May be needed in some cases, if there is no existing sketch or survey. Ordering a survey will usually draw about $1000 from your wallet. Is usually purchased through lawyer, approximately $200. depends on the date & accuracy of the assessment, but usually ends up being several thousand dollars per year. Policies vary based on coverage selected. Expect premiums of about $400 per year. Plan on paying up to $2,000 for your real estate lawyer. Vary depending on the type of mover you selected. If you plan to make changes to your new home shortly after moving in, factor in any costs of repairs you are expecting to undertake. Where applicable, condo fees and townhouse fees typically amount up to a few hundred dollars per month. This includes telephone, gas, electricity, cable TV, satellite TV, Internet, and so on. Some utilities may ask you to pay a deposit.